Jefferson suspects that Tobias is behind a recent malicious attack, and brings Henderson to the tailor's. Tobias reaches out to Dr. Jace. Den of Geek - Tobias' kill count rises on a devastating episode of Black Lightning. I kept thinking Jen was going to discover a way to use her powers to heal Khalil, aw well. Can't say I'm looking forward to yet another iteration of the "heroes don't kill, that's what makes us better than the villains" arc of Jen and Jefferson arguing over what to do about Tobias. Gambi's "no, I am a tailor" line delivery was adorable. I'm with you. Especially when it was so evident Khalil was dying, I though Jen would attempt to use her powers (or would unconsciously use them). I'm really done with all of the heavy foreshadowing and lampshading and name dropping around Markovia. 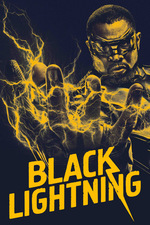 I can't see any way they are ever going to incorporate that (mainly Titans and Outsiders) storyline into this version of Black Lightning, and I'd much prefer they just drop it. The two universes just really aren't designed to mix, what with one being an American urban tale of racial tensions and abuse of governmental powers (plus some gang and drug stuff) and the other being some quasi-European tale of royalty and betrayal (and international assassins out for revenge). It's pretty much oil and water. The only way I can see this resolving is spinning off a new Outsiders show (which is still going to be the wrong approach, as this is really a pivotal Titans story, and there is no way they're ever going to cross over this show with that one, even if that one was in the position, teamwise, to tackle the Judas Contract arc, which it's not and which it won't be for the foreseeable future). I thought Grace showing up at this point was kind of random. I guess they want to keep building her presence and character, but using her just felt like a cheap and easy way to create something for Anissa's character to do this episode. It makes sense to finally come clean with Henderson, but I'm not sure how well his character is going to be integrated into Team Lightning. I also have to wonder how long Gambi is going to play meek and mild around him. It seems the parishioners were as useless when faced with the Holt's "heart attack" as they were when they found Khalil. I'm not saying they could have done anything to prevent the poison from taking over his system, but again, nobody seemed to be reacting usefully in the crisis (minus the one guy who unbuttoned the reverend's collar). I know the audience was given that really obvious look at the handkerchief, but you figure at least one of the church-goers would have noticed that bright pink splotch and maybe mentioned it to paramedics (assumed any were called) or the police. RIP poor Khalil. I was hoping Jennifer would shock him and fix everything too. That prom scene in the head. Awww. Hell, if I were her I would have at least asked him if he wanted her to try it. God, I hope Khalil told Jefferson some of that information before he died. They didn't show it though, sigh. I do not care about any of Anissa's various hookups at all, I can't remember them or tell them apart and I don't care. I don't think the show cares either or they'd put some effort into any of them. What's weirdest about this is that Young Justice S3 specifically went with an Outsiders arc, and beyond alll the concerns you raised, I can't see the powers that be wanting two dueling interpretations of that onscreen anywhere near each other. I mean, it's weird just from a marketing perspective. Grace has been hiding some power from Anissa; we know that she has super powers from the comics, but they've only hinted at it on the show. She's going to be recurring until those powers come into play, so I'm just waiting for that to happen. I'm kinda sad that they didn't save Khalil, but I guess they have to up the stakes with Tobias, and taking out both Khalil and Reverend Holt in one episode is a mirror on when they're both shot, it makes for pretty dramatic storytelling, which I can appreciate. The show is steering everything towards a team Black Lightning vs Masters of Disasters showdown, which is understandable for a superhero show, but I feel like we'll miss the nuances of family drama that made this show so great. I hope they can balance it well.